AirPAT is the most advanced natural grass rootzone management system in the world. Employing proprietary vacuum/ventilation technology to generate near-ideal growing conditions, AirPAT delivers superior results in any climate. AirPAT is designed for total customization, allowing the client to choose features most beneficial to their venue. 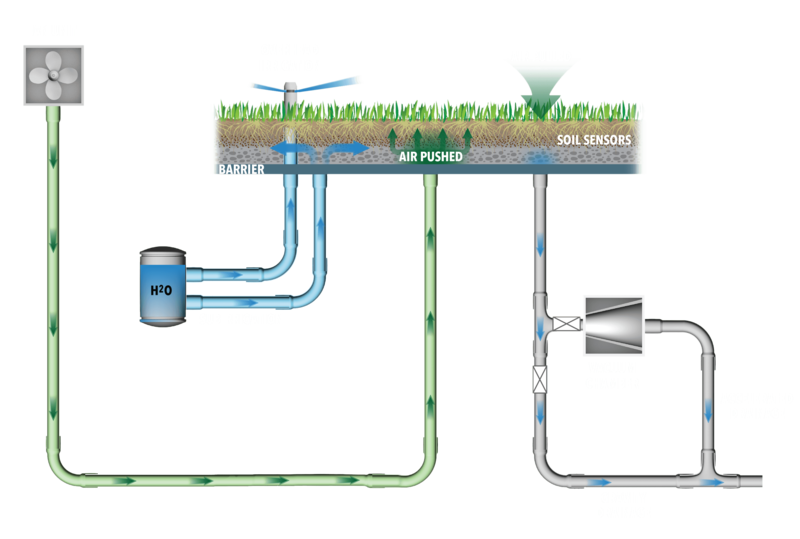 These can include vacuum drainage and forced air aeration, continuous rootzone monitoring, fully automated and remote system operation, water conservation and water recycling, rootzone conditioning using warmed and cooled air, and rootzone heating with overlain hydronic systems. To learn more about AirPAT or to request a consultation, give us a call at 877-789-9594 or contact us online! In addition to AirPAT, our line of natural fields for pro-grade sports venues also includes Eclipse. The Motz Group will help you navigate the best natural turf field system, allowing you to make an informed decision when choosing the best solution for your stadium’s surface. Natural grass turf systems will enhance your sports complex and give all high-performing athletes maximum playability, durability, and safety.